This week joined a competition website for sneakers design. The website is kicksguide.com, each month there is a theme for a sneaker design. This time the theme was iPhone. I tried my best to design something with the looks of the iPhone. 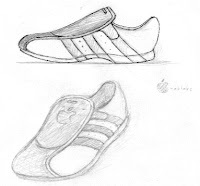 This is the sketch I made for the shoe, how ever I made some changes in the final render. 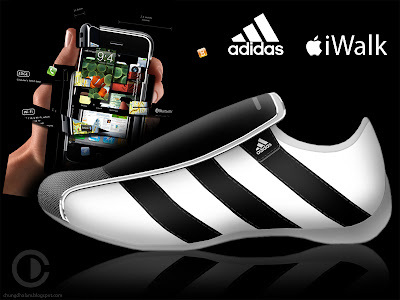 I left out the Apple shaped holes on the side and the Apple logo, so the sneaker would have a much more cleaner design. Also the side of the sole I left empty. I'll explain why the shoe look like this. The top flap on the shoe resembles the front of the iPhone, you can see the chrome edge and the hole of the loudspeaker. The nose of the shoe got a carbon look like the bottom menu of the iPhone. I left the shoe clean and the flap to cover the shoelaces. Just like the way the iPhone hides the buttons on the screen. The flap got a Velcro faster to hold the flap down so it wont be loose. The rest i left open and clear for the Adidas lines. This is the visual I submitted to the contest. Its a good experience, cause I learned how to render a shoe with photoshop. But next time I know I need to use Illustrator too and use a bigger size to make more and better detail. However I did made this render in a few hours time.